Ever since I was a kid I was always interested in optical illusions and tricks of the eye. I was fascinated by the ambiguity and making sense of it all. That fascination has continued into my adult life with the interests of pareidolia, that is, seeing animals faces and objects out of patterns. And when it comes to creating art, I am not alone in this exotic way! 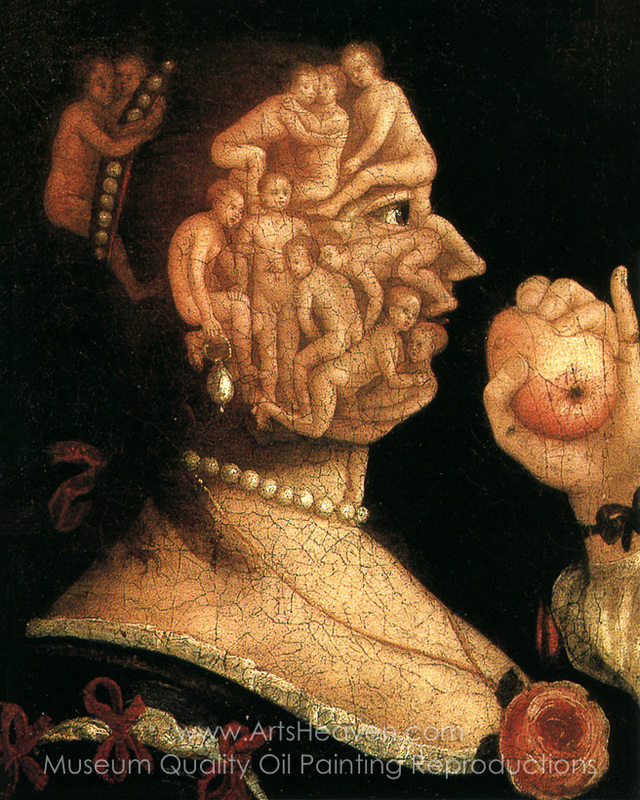 Giuseppe Arcimboldo was an Italian painter who used assembled animals, books, fruit, flowers, fish, and vegetables to create imaginative portraits of people. 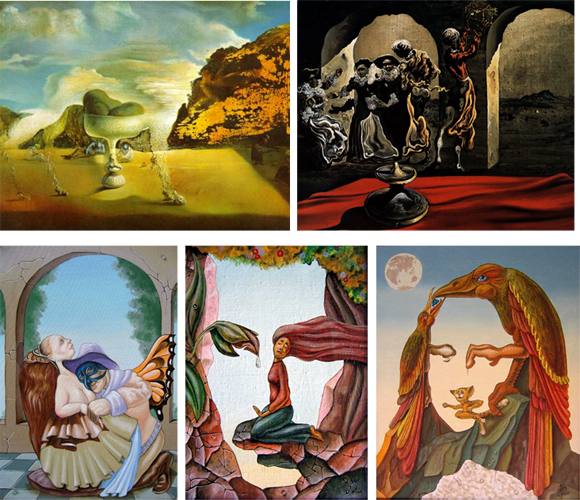 Artists like Salvador Dali have cited the groundbreaking painter's Composite Heads as a major source of inspiration. But it was Museum of Modern Art director Alfred H. Barr's inclusion of his works in the 1930s exhibition Fantastic Art, Dada, Surrealism that re-introduced the world to Arcimboldo's originality and influence. Retroactively, art historians dubbed the Renaissance Mannerist the grandfather of Surrealism. 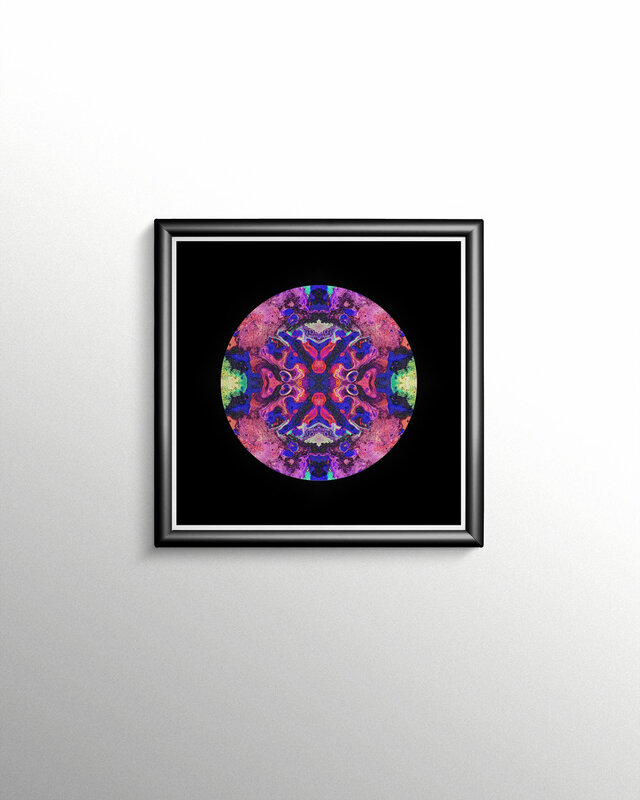 As for pareidolia in my art, these Modern Mandalas are simply a result of repetitively mirroring images. 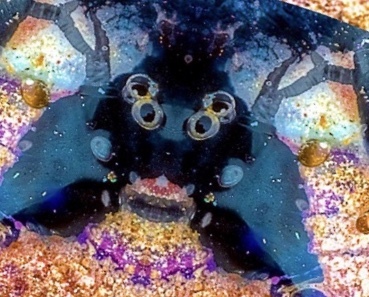 This cognitive type of optical illusion is effective at recreating the psychedelic experience through pareidolic symmetry. 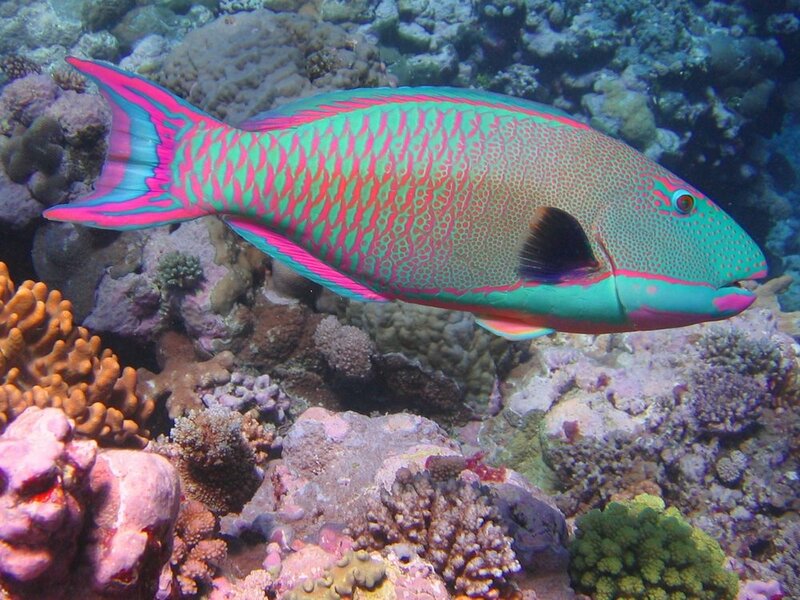 Whenever you mirror something geometric patterns are bound to arise. And as such, the mandalas conjure archetypes such as aliens, angels, demons, fantastical animals, insects, and the alike. It is worth mentioning that these images of pareidolia in my art are created by mere chance and are not created intentionally. It is the viewers’ imagination that keeps creating almost unlimited interpretations and variations that seemingly morph and flow — the more you look at the art. Modern Mandala: "Jester Eyes 1"
Examining pareidolia in art - Can you spot these fantastical creatures in my Modern Mandala? March 10, 2019 by Cameron E. G.
Very excited to announce my art store will be opening soon. Here’s a sneak peek of how it looks and works! 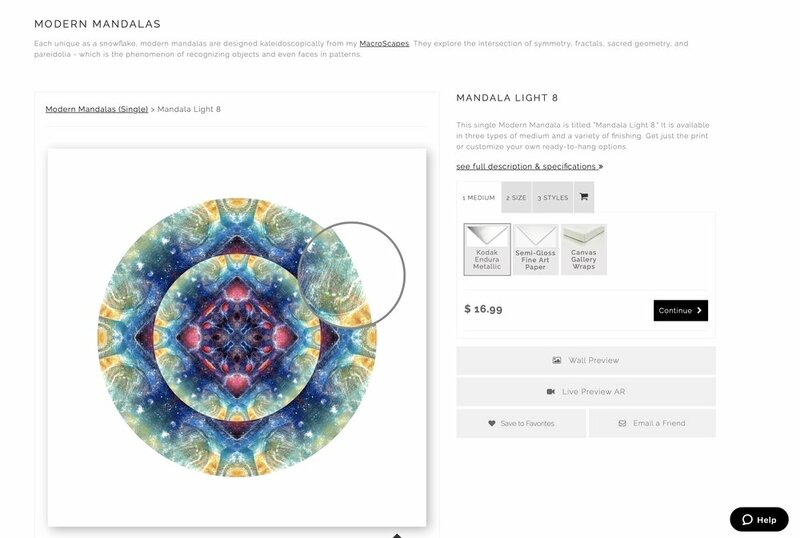 To start, there will be a handful of original paintings and best-selling prints of Modern Mandalas and MacroScapes available. The Best Sellers consist of selections that are popular at the gallery and also with my followers. Prints are archival quality and also available in stretched canvas. You can purchase just the print or get it ready-to-hang with custom frames or mounts. 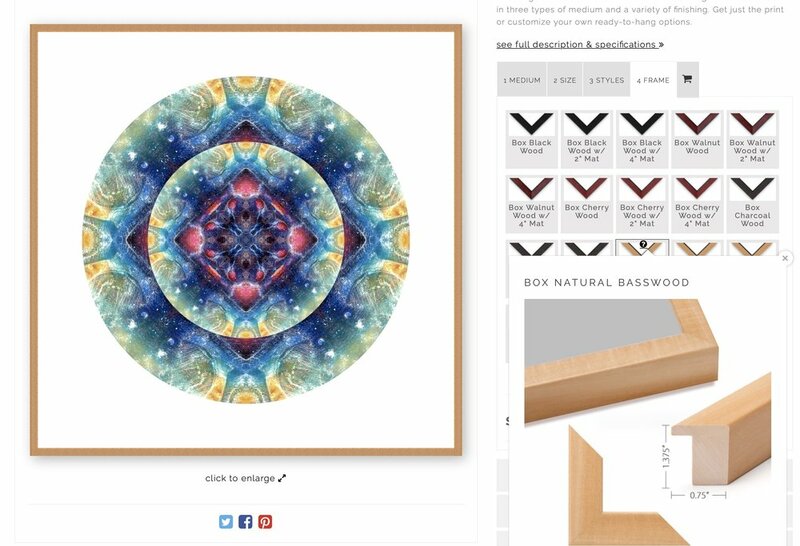 And because this is all done on the backend through automatic fulfillment with one of the best online art platforms, Art Store Fronts, I can minimize the need for inventory and keep cost of prints affordable. Choose from a variety of frames and even get it with a mat! You will be even able to preview the artwork in all available sizes and finishes, in a variety of environments. This will really help you get a sense of the "true" size of the artwork. And last but not least... this is probably the coolest feature: Live Preview! Live Preview is an augmented reality tool that taps into your phone’s camera and displays the artwork, so you can preview it right where you are. If you’re on your mobile device now, click this button. If you’re on the computer, scan this QR code with your phone (just pop open the Camera app). February 7, 2019 by Cameron E. G.
I know it's been a while since I've updated my blog. In no particular order of importance, here is a list of interesting highlights over the last several months. Creating a new series of Kaleido Jewels, which are created by transmuting photos of my acrylic paintings. So basically, art from my own self-sampled art. Setting up my second show at How Weird 2017 - the annual gathering which celebrated 50 years of the Summer of Love. It's one of my favorite events because I get to create a series of "street art." My first group exhibition outside of San Francisco, at the Pacific Art League in downtown Palo Alto! Group exhibitions at City Arts, a local favorite co-op gallery in the heart of the Mission District. Serious local talent - do go check it out. There are monthly rotating artists, so it keeps things fresh. A solo exhibition at Philz Coffee by the iconic San Francisco Ferry Building through the month of August. Participating at the SF edition of Pancakes and Booze - a national art show with, as the name implies: free pancakes, drinks, amazing DJs and a great crowd! Different from a normal art exhibition and a fun weekend overall. I've created a little photo story that capture some of the highlights over the last few months. In July 2017, I exhibited my newest format of art: Kaleido Jewels at City Arts! These are archival dye sublimation prints on aluminum and shine brilliantly. How Weird celebrates a diverse group of talented artists - ranging from musicians, visual artists and body painters. This 2017 edition was no different. I absolutely love the energized crowds. Also, it's an avenue for me to explore street art, something I don't normally get exposed to. August 29, 2017 by Cameron E. G.
Setting up a photoshoot with my new UV-reactive Lava / Volcano series. Since moving a few weeks ago, I now have my own studio space. And... what a world of difference. We picked up an IKEA Artist Table from Craigslist and it's perfect. The table height raises and even tilts; more importantly, dried paint is easily scraped and cleaned off. With the dedicated studio space and artist table, my productivity level has swung to full throttle. Lately, I've been working on a UV-reactive series that glows in the dark. By mixing UV paint, these new pieces glow vividly under UV/Blacklights. So far, my arts-in-progress include a large panorama of a volcano (see video), and three smaller pieces that others have described as "underwater shipwrecks" and "tropical coral." January 8, 2017 by Cameron E. G.
2016 was a tumultuous year for many, including myself. The year was filled with lessons and new firsts, including the debut of my art at the street festival How Weird in San Francisco. It was incredible to expose my emerging art to festival-goers and art lovers. Their fascination and positive encouragement pushed me to become more serious in my artistic endeavors. In the summer, I was honored to have several of my lithographic aluminum plates exhibited at ArtSavesLives, in the heart of historic Castro. Thomasina is truly an inspiration to many aspiring artists and her inclusion of my art was a great milestone. Fun people and incredible performances at the ArtSavesLives gallery. In the fall and Holidays, my art took a backseat as I switched jobs, moved in with my partner into a cozy apartment in the beautiful neighborhood of Duboce Triangle, and spent time with family. I am proud to reveal my new website, hosted on SquareSpace. Highly recommended for all artists / musicians. It was effortless and does all the things I need. Please follow me as I renew my focus on my art gallery in 2017. January 6, 2017 by Cameron E. G.